Historically, if you wanted to see big-time SP power, you would go west. Donner, Cajon, Beaumont Hill, etc. were a parade of SP’s best and biggest power. Understandably so, what with the grades to be surmounted. However, if you were interested in less than super-sized power, you must go east. Historically, the T&L lines were the refuge of smaller power, again because of the grades, or lack thereof. Yes, there were some (company) political issues as well, but that’s a different thread. 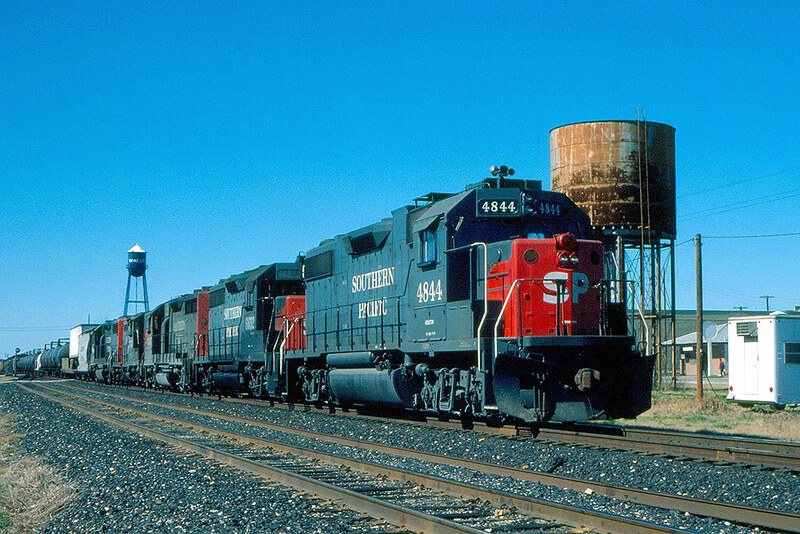 Here’s a wonderful illustration of my point: an eastbound manifest at Waelder, TX in 1985. 5 units, all 4-axle, have what appears to be a WCHOM in hand as it passes the west switch of Waelder siding. Note the dimmed headlights, a courtesy, tradition, and rules-requirement, in preparation to meet a westbound that’s waiting in the siding. If you wanted to see 4 T-2’s on the point, 4 more on the swing helper, and 2 more for good measure shoving on the caboose, you’d definitely go west. But if you had a hankering for something smaller, say a GP38-2 / GP35 / GP35 / GP9 / GP38-2 lash-up, you’d best disregard Mr. Greeley’s exhortation.